Dec. 18, 2014: In our Monday article we go behind the scenes of the doubts that were spread over the A380 by Airbus last week. To complete the picture we now update our competitive analysis that we did in February this year. We then compared the A380 to Boeing’s 747-8i, the 777-300ER and the forthcoming 777-9X. We also included Airbus closest aircraft, the A350-1000. A lot has happened since then. Airbus has done a lot of work on the passenger area of the A380 to offer increased passenger densities and the pictures of the emerging Boeing 777-9X and Airbus A350-1000 is now clearer. Sales efforts of the A380 has also progressed, with meager results despite adding a leasing proposition what should make the hurdles of operating a small sub-fleet of A380s lower. To understand why, we interviewed Mark Lapidus, the CEO of Amedeo, the leasing company which specializes in financing and leasing of A380s. We wanted specifically to talk to Lapidus about the reactions of the airlines to the A380 and what problems he saw in selling an aircraft of this type. In preparing the article we also gathered additional info from Airbus and Boeing, from the former around their work on the cabin configurations and densities, from the latter the maintenance costs for the up and coming 777-9X. In our February article we established that an A380 is roughly equal on fuel per passenger transported to the benchmark in the present non-VLA long haul market, the Boeing 777-300ER. We also found that this is highly dependent on how many passengers one assumes for both aircraft in the comparison. We could also see that come 2020, when the replacement of the 777-300ER would be available, the 777-9X, A380 would trail with up to 20% in fuel efficiency, once again dependent on how many seats were used in the comparison. At the time we only looked at a fuel consumption comparison; we did not include crew cost, maintenance costs, landing and en route fees to generate Cash Operating Costs (COC) or capital costs to come to Direct Operating Cost (DOC). In today’s updated analysis we add these costs items. Finally we have talked with Amedeos CEO Mark Lapidus, asking about his discussions with the Airline CEOs and their teams, to understand what the reactions are from the airlines and why has he not placed any A380 with customers yet. As we did this deeper study, a more nuanced and different picture emerged from the one seen in February. The results busts a number of deeply engraved myths, one being that four engines are more expensive to fly and maintain than two. Dec. 16, 2014: There have been record aircraft orders year after year, swelling the backlogs of Airbus and Boeing to seven years on some product lines, Bombardier’s CSeries is sold out through 2016, Embraer has a good backlog and the engine makers are swamped with new development programs. So it is with some irony that several Original Equipment Manufacturers (OEMs) are warning of cash flow squeezes in the coming years. With so many development programs in the works, the prospect of new airplane and engine programs are being trimmed. Most airframe and engine OEMs under pressure. The full impact of the pending cash flow squeeze hasn’t been appreciated by the markets yet. Update, 0530 PST Dec. 15: Aviation Week posted an article that indicates Airbus and Rolls-Royce are closing in on an engine deal that will lead to the A380neo and a stretch. Last week’s Airbus Global Investors Forum proved to be a debacle due to a rogue customer and two miscues by management. First, Group CFO Harald Wilhelm indicated Airbus may decide in 2018 to terminate the A380 program, causing consternation from Tim Clark, president of Emirates Airlines, which has 44% of the order book. Airbus Commercial management spent a good part of the next day in damage control. Second, with little forewarning, Airbus told analysts that production rates for the A330ceo would come down in advance of introduction of the A330neo. This news shouldn’t have come as a surprise, but for some it did. If they had closely followed sales efforts for the A330ceo, the lack of success and the production gap, news that Airbus will bring rates down more than the 1/mo decline previously announced shouldn’t have surprised. Still, Airbus had not previously sent strong enough warning signals. Third, profit and free cash flow warnings weren’t well received. Finally, Akbar Al-Baker, the prickly CEO of Qatar Airways, chose the first day of GIF to announce he wasn’t going accept delivery of the first A350-900 three days later. The result: the stock price plunged 10% on Day 1 of GIF and another 4.3% on Day 2. Dec. 10, 2014: As company investors’ days go, Day 1 of Airbus Group didn’t go well. Airbus stock traded off 10% on news that the A330 production rate, already to reduced from 10/mo to 9/mo in 4Q2015, will be further reduced in 2016. No number was given. Then Airbus acknowledged it may decide by 2018 whether to terminate the A380 program. There were no sales this year. And true to form, the CEO of Qatar Airways, Akbar Al-Baker, did another one of his famous U-Turns. Only a short time ago he was singing the praises of the A350, the first of which was to be handed over to his airline on Saturday. Today he announced delivery was postponed “until further notice,” with no explanation for the delay. The stock reverberation didn’t end there; it migrated across the Atlantic, sending Boeing stock down on Wednesday at a rate twice that of the Dow Jones index. A330ceo sales have dried up in advance of the A330neo introduction. A large Chinese order appears to be going nowhere. The A380 program is supposed to finally hit cash break-even in 2015, but no sales put this program in doubt. The only way to boost the A380 is to do a neo and the business case is iffy. Dec, 8, 2014:The Boeing 737-8 MAX is the successor to the 737-800 and has largely been thought of in this context. 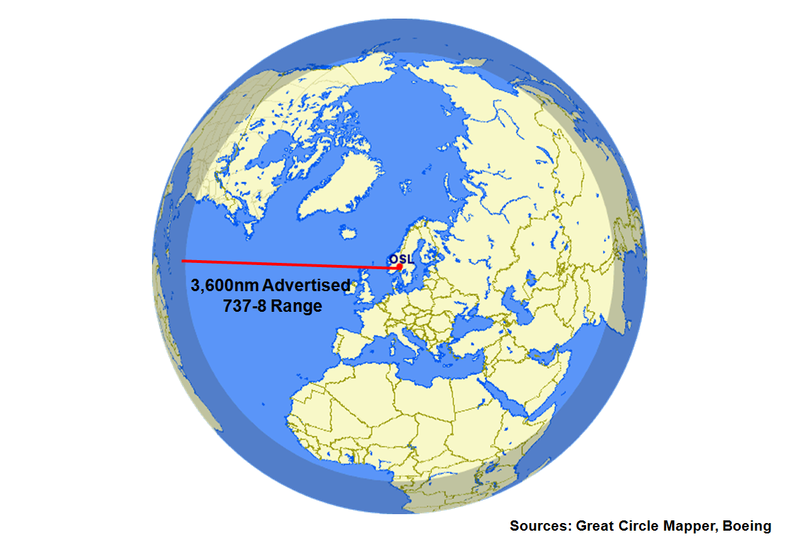 Our analysis, prompted by Norwegian Air Shuttle (NAS) plans to use Boeing 737-8 MAXes to begin trans-Atlantic service on long, thin routes, comes up with a conclusion that has gotten little understanding in the marketplace: the 8 MAX has enough range and seating to open a market niche below the larger, longer-legged 757, and the economics to support profitable operations for Low Cost Carriers interested in some trans-Atlantic routes or destinations beyond the range of the -800. We based our analysis on our proprietary, economic modeling, assumed Norwegian cabin configuration standards. We compared the operating costs of the 737-8 with Norwegian’s present long haul aircraft 787-8 in a similar cabin configuration. The comparison range is the max endurance range for an LCC long haul 737-8, eight hours or 3,400nm air distance (no wind included). Nov. 30, 2014: Airlines now lease about 50% of their aircraft under a variety of mechanisms: operating, finance, leveraged and Islamic leases, just to name a few. There are operating leasing, special purpose and “house” companies. There are leasing units of investment banks, insurance companies and a host of others. Ireland is a popular leasing venue because of favorable tax laws. The Big Four airframe OEMs have long sold aircraft directly to lessors, and the emerging airframe OEMs, COMAC and Irkut, have seen orders placed by emerging lessors in their home countries. ATR, the turbo-prop OEM, also has received orders from lessors. Today we look at the lessor relationships with Airbus and Boeing. Lessors represent a significant, but still a minority, part of the Airbus and Boeing backlogs. 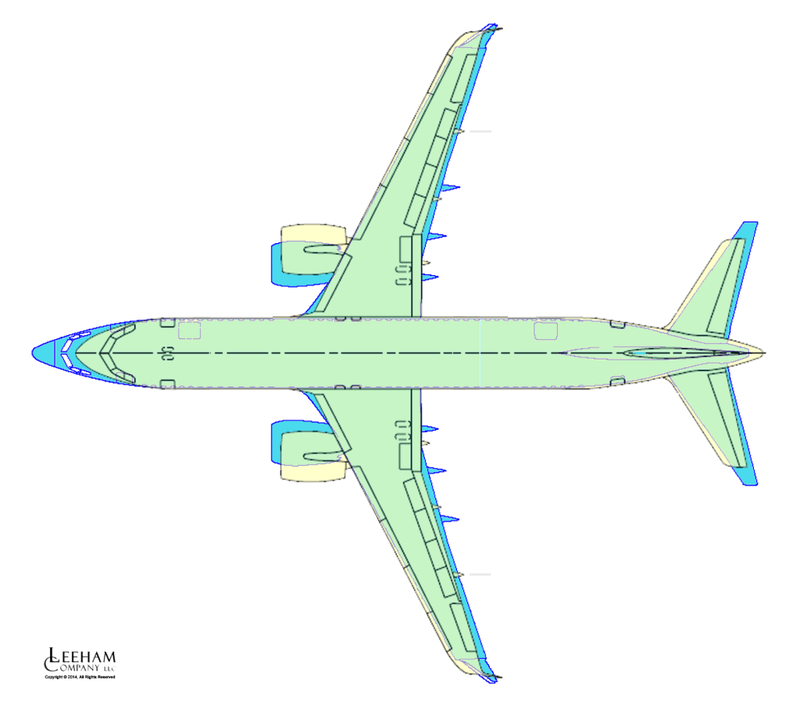 Widebody airplanes constitute a small portion of lessor orders. Boeing has more widebody lessors orders than Airbus. Airbus has a larger lessor order book than Boeing. With the end of the year a mere five weeks away, Airbus appears to have made little progress in closing its production gap for the A330. Airbus still has a gap of approaching 150 production slots at current and announced rates between now and the planned EIS of the A330neo in December 2017. Launch of A330neo helps, but does not cure production gap–especially between now and 2018. No Chinese order for A330 Regional after more than a year. AirAsiaX deferring orders–and will some CEO orders be swapped for the NEO? Low cost long haul service is gaining traction, but previous efforts proved difficult to be successful. Dating all the way back to Laker Airways’ Skytrain and the original PeoplExpress across the Atlantic, airlines found it challenging to make money. More recently, AirAsiaX retracted some of its long-haul service, withdrawing Airbus A340-300 aircraft when they proved too costly. The airline recast its model around Airbus A330-300s as an interim measure, unable to fly the same distances as the longer-legged A340. AirAsiaX ordered the Airbus A350-900 and now is a launch customer for the A330-900neo. Cebu Pacific of the Philippines is flying LCC A330-300 service to the Middle East. Norwegian Air Shuttle famously built its entire LCC long haul model around the Boeing 787, initiating service with the 787-8 and planning to move to the 787-9. Legacy carrier Lufthansa Airlines plans to use fully depreciated A340-300s to begin “lower cost” (as opposed to “low cost”) long haul service. LH says the fully depreciated A340s come within 1%-2% of the cost per available seat mile of the new, high capital-cost 787s. AirAsiaX’s A340 LCC long haul service proved unprofitable. Can Lufthansa’s similar service with fully depreciated A340s work? Our analysis shows that it can. It can even support the lease rates that would be charged for a 10 year old A340 if the fuel price remains at the present level. When doing the research for this article and going through the results of our proprietary model we started to ask ourselves, is the A340-300 the ugly duckling of the airline market? Boeing’s ability—or inability—to bridge the production gap for the 777 Classic to the 777X entry-into-service in 2020 was a top concern of a series of Wall Street types during a recent series of meetings we had across the USA. There is a great deal of skepticism over whether Boeing can successfully maintain the current production rate of 100/yr (8.3/mo). People we talked with look at the number of orders Boeing needs to bridge the gap, the Boeing claims that it can obtain 40-50 or 40-60 a year, and, in a more recent development, the falling oil prices depressing the need for a new, more efficient 777-300ER compared with the 2004 model and the even older 777-200ER series. We have been telling our clients since March that Boeing will have to reduce the production rate of the 777 because of the large production gap. Aerospace analysts began waking up to this possibility by May and the broad consensus today is that Boeing will have to reduce the rate—the only questions remaining is by how much and how soon. As recently as the 3Q2014 earnings call, Boeing continues to assert it will be able to maintain rates with new sales. Boeing has booked 43 firm orders through October for the 777 Classic—39 for the 300ER and four for the freighter. This is as the low-end of the range Boeing says it needs. However, our Market Intelligences gathered over the summer and into the fall indicates sales efforts are struggling. Lessors will be compelled to offer -300ERs for low prices, depressing opportunities for Boeing. Boeing 737 MAX 8 as a long and thin aircraft and how it fares in general versus Airbus A320neo. Over the last weeks we have looked at Boeing’s 757 replacement possibilities on its long and thin network niche, including a ground breaking launch interview for the A321neoLR with Airbus Head of Strategy and Marketing, Kiran Rao. In the series we have seen that the A321neo has the potential to replace the 757-200 on long and thin international routes. Boeing’s equivalent single aisle entry, 737 MAX 9, has problems to extend its range over 3,600nm. It is too limited in the weight increase necessary to cover the longer range. Many have asked how the less- restricted Boeing 737 MAX 8 would fare, suitably equipped with the necessary extra tanks. This is the subject of this week’s sequel on the theme long and thin. At the same time we look at Airbus entry in this segment, the A320neo, to see how it stacks up to the 737 MAX 8, both in their normal 1,000 to 2,000nm operation and then also in a long and thin scenario. The Boeing 757-200 with winglets can serve international routes with city pairs up to 3,500nm. 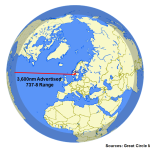 The rest of its range capability (about an additional 500nm) is needed for unfavorable winds and reserves. The A321neo has the capabilities to be extended to cover the range of the 757-200. This was also announced by Airbus during our series. The improvements are an increase in range of 500nm by virtue of three extra center tanks and an increase in max takeoff weight of 3.5 tonnes ( 7,400 lb). The efficiency improvement over 757-200 would be 25% with a small decline in passenger capacity (162 vs. 169 seats) in a typical First, Premium economy and economy cabin. Boeings 737 MAX 9 fares less well. While it has the wing to fly the range, the aircraft’s squat stance hinders the aircraft to cant the wing to generate the necessary lift for an increased takeoff weight. MAX 9 can’t rotate to more than 70% of the angle of an A321neo. Subsequently the take off distances get too long with any weight increase. Boeing’s New Small Airplane study covers from 130 to 240 seats and evaluates both single and dual aisle alternatives. The big question mark is when an entry into service (EIS) is necessary and therefore when a launch decision has to be taken. We think after the 777X has entered flight test in 2018/19 for EIS 2025. Boeing’s CEO, Jim McNerney, says he sees EIS as 2030 for a new small airplane. We argue this risks missing the boat. The 737 MAX 8 is 1.5m (5 feet) longer than A320 with a 2.5m (8.2 feet) longer cabin. This brings a 12 seat higher capacity, everything else being equal. The result is that the MAX 8 beats the A320neo on per seat efficiency while being worse on trip efficiency. The MAX 8 has a range on internal fuel of 3,700nm. This makes it suitable for extending the range up to 4,000nm with smaller changes. It thereby is probably Boeing’s best bet of offering a long and thin aircraft before the New Small Aircraft (NSA) comes to market. Its major drawback is a 33 seats reduction in capacity compared to 757-200 when both are configured for long and thin. A320neo is less ideal to extend to long and thin. It requires several extra fuel tanks to get to 4,000nm nominal range and then there is too little space left for luggage. Figure 1. Boeing 737 MAX 8 overlaid with Airbus A320neo. Source: Leeham Co.